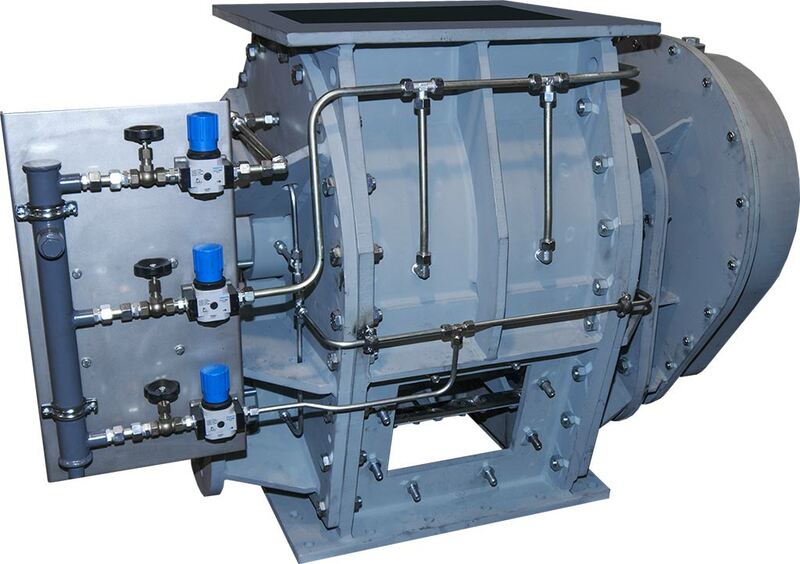 KÖLLEMANN Self-Cleaning Rotary-Valves have their field of application within the dosing, sealing, feeding and discharging as well as measuring of bulk-solids in sticky, bridging and wet conditions such as coal, salts, ashes, limestone, slurries and methyl cellulose. Rotary-Valves work on the principle of volumetric-transport, at the inlet-section the bulk-solid falls by means of gravity into the mostly star-shaped chambers. While the rotor turns, a determined volume of the bulk-solid is moved towards the outlet. 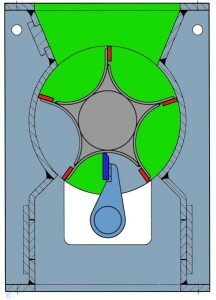 Based upon the fixed geometry of the rotors chambers, the conveyed volume is well defined. The forced cleaning ensures a proper discharge of every kind of material even if handling this would be a tough task in a standard model. By means of a synchronization gear an underneath located scraper cleans each chamber to maximize the throughput and to ensure the proper function without clogging of the bulk-solid. Due to the sophisticated engineered geometry our rotary-valves offer a minimum gap between the half-pipe shaped chamber and the scraper which results in lowest possible residues. Our product-range provides various options, designs and materials. The lion’s share of our Rotary-Valves is produced as a weld-construction, which is available in all customary materials. We provide plenty of options and extra equipment to perfectly serve all of your requirements and demands which arise from the conditions of your bulk-solid. We offer furthermore optional heating or cooling, depending on the application. As an process-optimized extra-equipment we offer amongst others overfill-protection and leakage-air collectors. 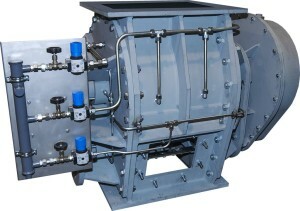 In order to antagonize abrasion as well as premature wear and beyond to minimize the maintenance effort, it makes perfect sense for many KÖLLEMANN Rotary-Valves to install a specifically hardened wear-bush and sealing-strips. This option is especially recommended for applications with a high abrasive content within the bulk-solid such as our power-plant optimized valves. Most of the time the coal contains remarkable traces of stones and other abrasives, due to this option an extended service-life can be achieved. As we produce each rotary-valve fully based upon your special requirements, our sales-team is looking forward to assisting you. © 2019 Köllemann Förder- und Verfahrenstechnik. All rights reserved.